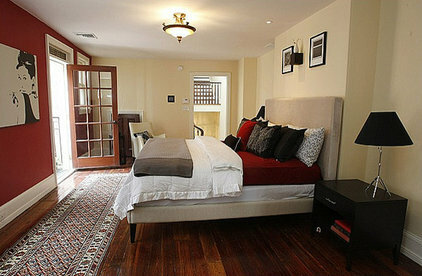 Add a little spice to the bedroom with ... paint! Whether you're looking for some va-va-voom, a playful environment or a serene atmosphere for rest, an accent wall can strike whatever mood you desire. Take a slide down the rainbow to find just the right color for your bedroom. Ravishing red. Red is the color of love. Profess your love of life, your significant other and yourself with a bedroom wall dedicated to this powerful, inspiring hue. Get the look: Try Behr's Regal Red 150D-7 as an accent to Vanilla Custard WD220. Eye-opening orange. Orange awakens the soul and stimulates creativity. Kids in general and artistic minds will feel fueled by its energy. 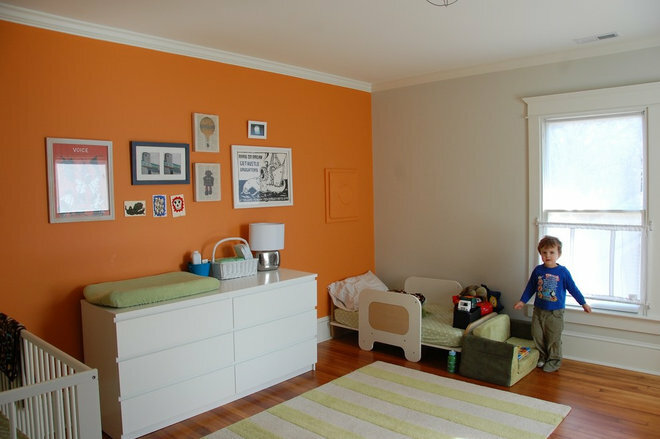 Get the look: Use Valspar's October Bronze LA716 as an accent to Stony Path 5007-1B. Cheery yellow. Yellow is one of the most jubilant colors in the rainbow. Try to not feel happy when you're looking at it. Just try! Imagine how much better your day would be if you were to wake up to this color every morning. 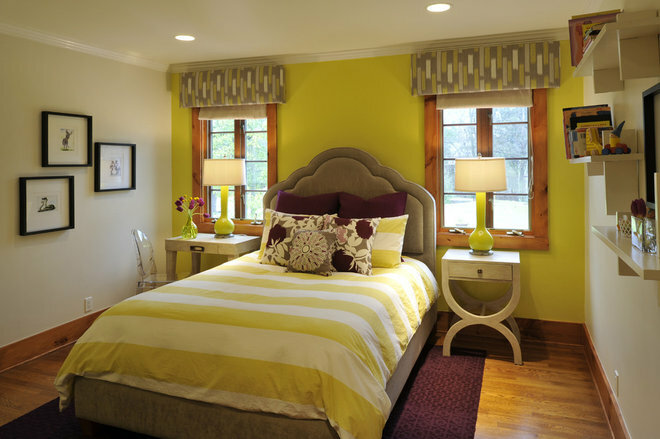 Get the look: Use Sherwin-Williams' Funky Yellow SW 6913 as an accent to Shoji White SW 7042. Gorgeous green. Green represents balance and growth. Balance your chi in a bedroom accented with this hue. 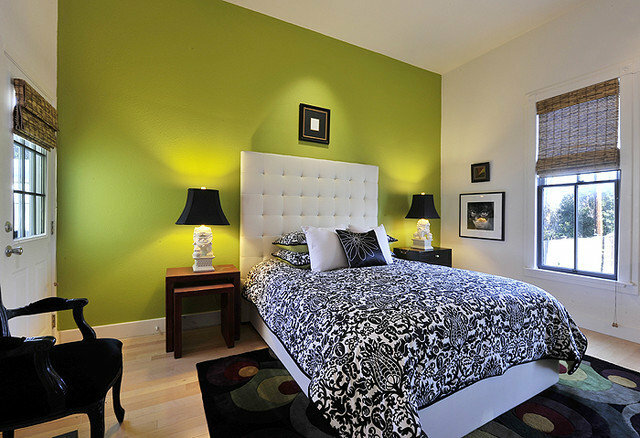 Get the look: Use Sherwin-Williams' Overt Green SW 67818 or Benjamin Moore's Dark Lime 2027-10 as an accent to white. Calming blue. 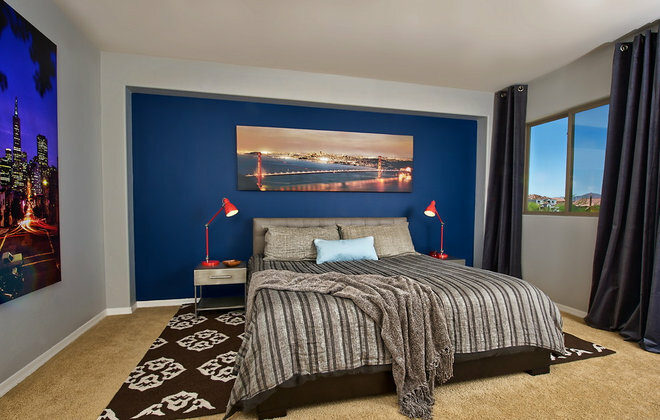 Turn the master bedroom into a sanctuary with soothing light blue. Maybe the tranquil glow will even convince the kids to keep things cool, calm and collected when deciding to deliver a complaint in here. Get the look: Try Sherwin-Williams' Spa SW 6765 with cream. Maritime blue. Ahoy there, matey. No matter how far away your house may be from an ocean, you'll almost be able to hear waves lapping the shoreline in a bedroom showcasing this powerful, nature-inspired tone. Get the look: Use Behr's Planetarium 560-D as an accent to Dolphin Fin 790C-3. Purplicious. Purple symbolizes magic, mystery and royalty. If it's the right tone, it can also be elegant and romantic, like this shade that straddles blue and gray. Get the look: Use Benjamin Moore's Evening Dove 2128-30 as an accent to white or gray. Taking things to "gray-t" heights. Gray is a go-to neutral because of its strong yet soothing nature. 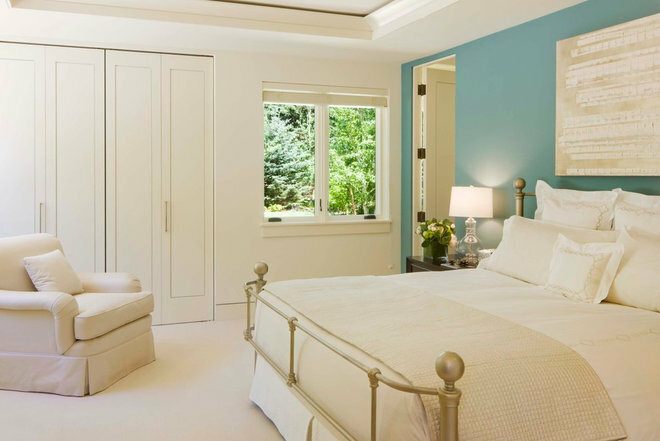 This bedroom has not only an accent wall in this color, but an entire ceiling. Get the look: Use Betonel's Intercoastal 30BB 16/031 or Benjamin Moore's Ocean Floor A2001 as an accent to pure white or white with a hint of gray. Sophisticated brown. Brown symbolizes orderliness, which is the sort of state any busy person yearns for at night. Leave chaos at the door when you enter a room with a brown accent wall.